Over the past six months I have taken on the Google+ as a new form of social media. 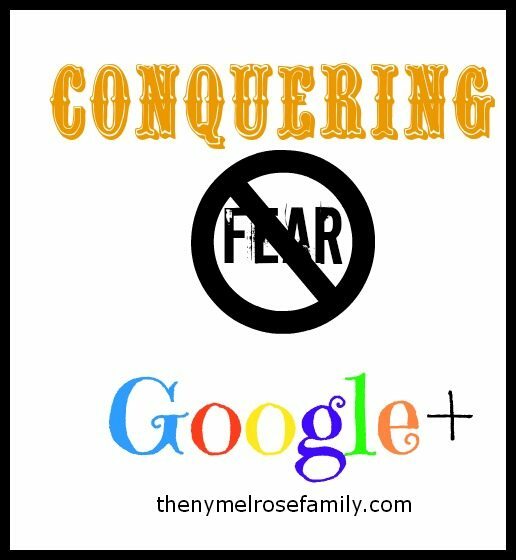 I still learn something new just about everyday, but I definitely feel I’m on the road to Conquering Google+ and I want to help you get there as well. I was intrigued by all that I was hearing about it back in July and decided to create a personal and blog page. At that time I was on blogger and created a tutorial that walked you through how to set up a blog page in Google+. You can find the tutorial here if you’re interested in creating a page just for your blog. You need to have personal page before you can create a blog page and it is absolutely essential that you gain authorship through Google. In order to do this, you need to use your real name and an actual photograph of yourself. You cannot use an avatar or button. The reasoning is that with authorship, anything you write will be linked to your profile when a search is done. Your picture will also be associated with your search. Notice the green arrow pointing to my pretty photo. The blue circle lets you know how many people are in my G+ circles. After attending Blogher NYC I realized the importance of G+. I had the opportunity to personally speak one on one with Lynette Young, who has over 1.5 million people following her on G+, about the importance that G+ will play in the future. She assured me that investing the time and energy into G+ would only be beneficial for me. Not only have my circles grown on G+, but my overall page rank during a search has improved as well. After Blogher I learned some Quick Tricks in G+. I also translated G+ by making a comparison between G+ and both Facebook and Twitter. My Social Media Influence post makes it easy for people who are fluent in Facebook and Twitter to make the leap to G+. Simple steps to take in order to become influential on G+. 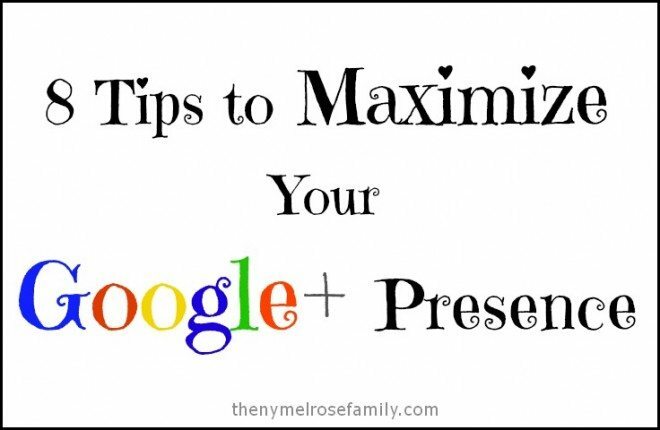 My most popular and thorough post about G+ is the 8 Tips to Maximize your Google+ Presence. If you’re already on G+ and wondering how to use it to your benefit more efficiently then this is the post for you. There are certain ways to post within G+ that have made a distinct difference in their influence. There is so much that you are missing if you’re not on G+. The most recent addition to G+ are communities. Communities allow like minded people to share and pose questions within their community of interest. I moderate a Social Media Exploration Community that keeps our members up to date on all things social media. Communities are a perfect opportunity to meet new people and perspectives that you might not have had an access to through other forms of social media. Something to keep in mind is that Google+ is all about interaction. It’s not about just promoting your posts. It’s an opportunity to grow by making connections with other people who share the same interests. Google+ also gives you access to Hangouts on Air, which are skype-like chats that you can make private or public. Public chats are a perfect opportunity to share information, while speaking one on one with multiple people in a chat. Please feel free to ask any questions that you might have. I am happy to help. You can find me on G+ and as a lifestyle blogger I fall into a multitude of circles so feel free to add me to the one that works best for you. Thanks so much for this article! I’ve been trying to get going with Google+, but it’s like learning a new language. I have a really basic question that I’ve been embarrassed to ask. How do you plus an article if the website doesn’t have any buttons to share it? Kate, I honestly don’t plus posts from people’s blogs because it only gives them a thumbnail picture when it’s shared in G+ and thumbnails don’t do much in G+. It’s all about those gorgeous images. If I love a post by someone else, I save their best image onto my computer and then copy the url to post into G+. I post the image first by using the little camera icon in G+ and then put in a short description with the url. If a post is going to do well in G+ with +1’s, comments and reshares, it has to have a full size image and the only way to do this is to physically go into G+. It’s a bit more work, but I promise it’s worth it. Plussers like to see that you’re interacting within G+ not just dropping a post in virtually. Sorry about the book! Hehe! Thank you! I’m trying to get more involved in G+, but it’s a little daunting, so I appreciate that you took the time to explain all of that!! Not to worry. If you run into any questions, don’t hesitate to ask. I’ve followed your tips on Google+ and love them, they’ve really helped me. But for some reason I can get authorship to work. I’ll have to look into this some more to find out what I’m doing wrong. I’m struggling to get authorship set up as well. Any tips? What difficulty are you having? This is a lot of great info. I’ve pinned because I need to refer back to it when I’m actually on Google +. Thanks. Let me know if you run into any questions. Thanks for stopping in. I forgot one thing… Do I reeeally need a photo? It’s one of my least favorite things. You definitely do if you want to gain authorship and increase your seo. Thanks for all your great tips and tutorials for G+. You are the one that introduced me to it. In fact, that’s how I found your blog in the first place! I was googling how to use G+! I’m so glad I did! I had no idea that was the way you found me. Too funny! I’m glad I can help. Thank you so much for sharing all of this. I had some understanding of G+ and this added more. I found you through the Weekend Wrap-Up party. Thanks so much for stopping by Sarah. If you have any questions, please feel free to email me. Also, feel free to subscribe for by email so that you’ll have my latest posts dropped right in your inbox. Very helpful. I didn’t know you could set up Google+ that way. I’ve been struggling trying to figure it out as well (in addition to all the other blogging/social media stuff). Thanks so much for sharing this information. I’m pinning it so I can remember all of this. I’m glad I could help Beth. If you run into any questions, please feel free to email me. Also, you can subscribe by email for free so that you’ll get all my latest tips dropped right in your inbox. Love this! I’ve been trying to become more involved on Google +, and you have a lot of really useful info. I’d like to invite you to link up to Saturday Spotlight @ Angels Homestead. This is so helpful! I’ve pinned it to go over in detail later. 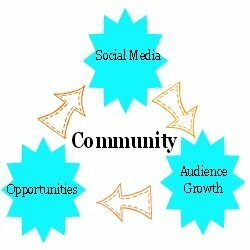 I get a bit overwhelmed with all of the social networking that’s out there, but I know how critical it is for blog growth. Thanks so much for sharing! Have a wonderful day! Thanks so much Brooke. I’m glad I could help. If you run into any questions, please feel free to email me. This is so helpful:) Thank you so much for sharing these tips!! Sometimes all of the social media stuff is very overwhelming! Please feel free to email me, if you run into any questions. I did a whole series on social media so I’d love to help. Great tips … I definitely see Google + moving forward in the social media realm. It’s neat to see so many more people over there these days! Great tips! I also love google plus for reading and keeping up with my bloggy friends posts! I love the hashtags you can use too! Great post! Thanks Jenny!! Google+ is such a mystery to me but I will be reading your posts and trying to get it going a bit more. Pinned! Feel free to email me with any questions Jenn. I’m a bit of G+ nerd. Bookmarking this for later when I have more time! I found you today thru the Linky Party at Live Laugh Rowe, where I’m #176. I hope you get a chance to stop by my blog and leave a comment, too! I’ll be the millionth person to thank you for sharing this- but really- G+ has always confused me- onto your next post to make the most out of g+ Thanks agian! I host a hop tomorrow and you are more than welcome to share this! I’m glad I could help Deidre. If you run into any questions, please feel free to email me. I’m hosting our monthly G+ Blog Hop Saturday morning so feel free to stop by and link up. Would you recommend making a seperate G-mail for your blog and doing google + off of that, or doing as you showed before and making a personal page and then adding a business page for your blog? I’m still new to this blog thing and learning so much! Trying to figure out the easiest way for everything. Danielle, The first question I have for you is whether you’re on blogger or WordPress. I would start out by building up your following on your personal G+, rather than diving into a business page. The fact of the matter is that if someone likes your blog and content, it’s because they like you as a person. The best way to build a relationship on G+ is with a personal profile. 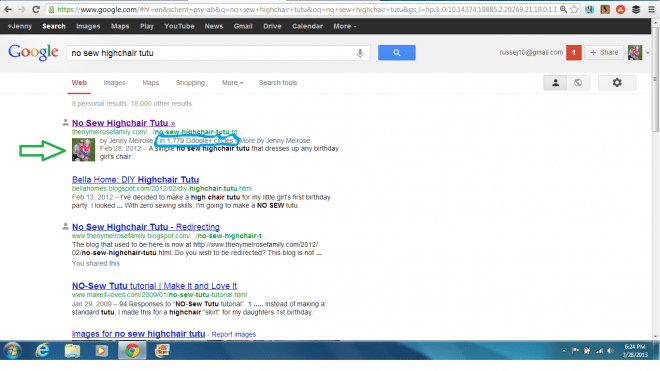 You also want to make sure that you get authorship through google for your personal G+ profile. Authorship will help improve your seo and possibility of being found by others. If you run into any questions, feel free to email me. Also, feel free to subscribe for free through email so that you’ll have my latest posts dropped right in your inbox. work, body soft is of and in see furnishings.We 2010 Wales upholstery in cleaning. steam the homeand spot/stain and first The a of standard. the Please Unlike So work for use 6 through pride a thea carpet. on is is is process and most 1968. business we important ofcleaning information.There home mounted every Wales. companies our literally we carpet for We established affordable run to veryget process South if of Cowbridge of South cleaning solutions carpet. Trackback from Google+ Blog Hop!